Homeowners with paid assistance working on vinyl siding clean-up and repair projects can easily run afoul of the federal EPA rules on handling lead paint. If there's a possibility that lead paint is on window sills, on painted surfaces, or under the vinyl siding, EPA rules come into play. Vinyl Siding Cost of Compliance: Are You Exempt? The general rule of thumb is that homeowners and do-it-yourselfers are exempt from the regulations. If any form of payment is involved, the rules apply and the cost of owning vinyl siding skyrockets. EPA rule compliance is expensive. Here are the minimum requirements. Test for lead paint. If lead paint might have been used on the house exterior in the past, a lead-test kit has to be used. Most houses painted before the 1960s have lead paint. If lead is detected you'll probably be required to hire a certified lead paint inspector. 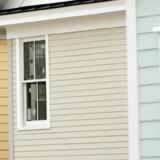 Clean vinyl siding without disturbing the paint. If you pull or pound a nail you've potentially created dust and the rules apply. Use required equipment. You'll need a half-face respirator mask with a HEPA replaceable filter cartridge, eye goggles, and disposable gloves, coveralls, and shoe booties. Vacuum the dust. Any dust created needs special bags and disposal. Lay 6-mil plastic sheeting. Plastic should extend about eight feet out from the house foundation to catch paint chips and dust. Roll it up and dispose of it after use. People that are involved in vinyl siding cleaning and repair and who might contact lead paint are now strictly regulated unless specifically exempted. Inform yourself of your responsibilities by contacting your local EPA office. The vinyl siding cost estimates for cleaning and repair are going up.